The Newman Civic Fellows Award is named for Dr. Frank Newman, one of the founders of Campus Compact, who dedicated his life to creating opportunities for student civic learning and engagement. Newman Civic Fellows are nominated by their institutional presidents. Through the Newman Civic Fellows Awards, college and university presidents acknowledge students with the ability and motivation to create lasting change in our communities. For more information about the Newman Civic Fellows, visit www.compact.org. 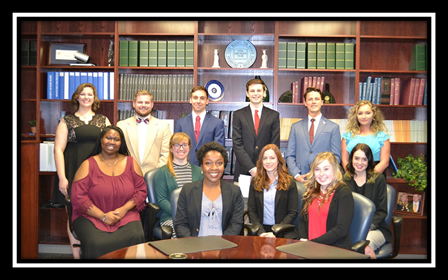 All 12 of the 2018 Newman Civic Fellows traveled to Oklahoma City April 26 for recognition by the State Regents for their substantial contributions to civic engagement in their communities. Pictured from left to right are: (front row) Kalen Russell, UCO, Sabine Brown, OU-Tulsa, and Katie Hardin, OSUIT; (second row) Alexis Harris, RSC, Tiler Rose, SWOSU, and Quinn McCormick, RSU; (back row) Raegan Mach, NOC, Matthew Staples, CSC, Matthew McClure, OU, Turner Smith, OC, Joseph Mason, TCC, and Riley Pearce, NWOSU. 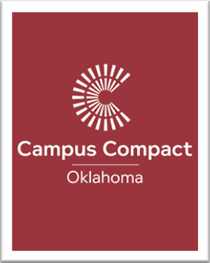 The Oklahoma Campus Compact annual state award program recognizes outstanding leadership and contributions by faculty, staff and community partners. The inaugural awards were presented at the 2011 Campus Compact Heartland Conference in September in Overland Park, Kansas. Campus Compact recognizes one faculty member for exemplary leadership in advancing the civic learning of students, including public scholarship, building campus commitment to service-learning and civic engagement and fostering reciprocal community partnerships. Applications are available each spring and posted here.